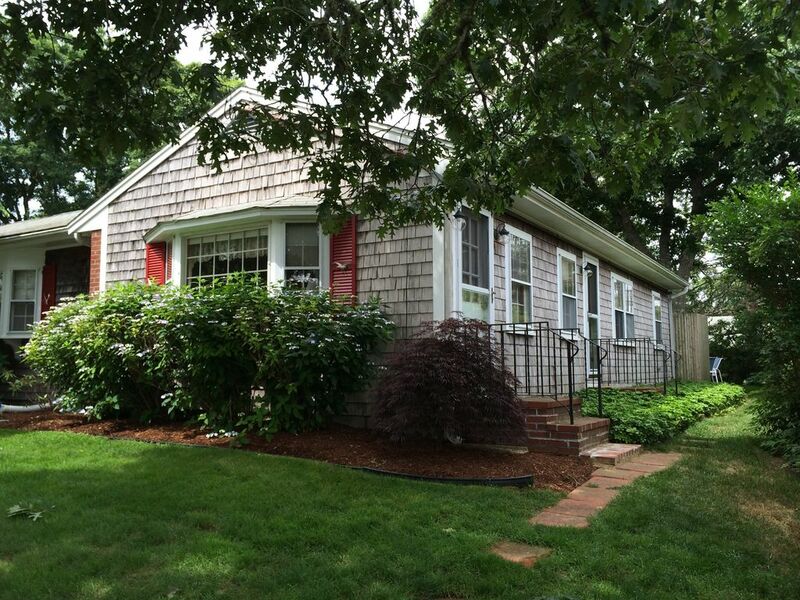 Charming 2 Bedroom in well maintained neighborhood in West Harwich,MA. It is an easy 5 minute walk to Pleasant Street beach. There is a living area and a well-equipped kitchen. Of the two bedrooms, one bedroom has a queen bed and other bedroom has 2 twin beds. New mattresses on all beds in 2017. There is a nice outdoor area with gas grill, table, and outdoor shower. There is also the luxury of central a/c, which is not common on the Cape. Parking for 2 cars maximum. Sheets/Towels can be provided for an additional fee. Central A/C, outdoor shower, outdoor picnic table, Easy 5 minute walk to Pleasant Rd Beach. 4 beach chairs and 1 umbrella provided. Sheets and towels can be provided for an additional fee. The apartment is exactly as described in very friendly neighborhood with easy walk to great beach. We appreciated that there were beach chairs and umbrellas for our use and that there are clean restrooms at the beach. The owners are very nice and really want to be sure their renters are happy staying at their home. We have rented numerous times at the Cape and this is among the best we’ve rented. Highly recommend for couple or small family. Wonderful place to make memories! This was my 1st time in this rental, & it was a 100% pleasurable experience, from the owners themselves, to the apartment & its amenities, to its fantastic location. For just my son & I, it was perfect - SO close to the beach, & we just loved the outdoor shower. The updates the owners have made to the kitchen & bathroom are well done, & we both kept referring to it as "going home" at the end of our long days...which is exactly the atmosphere we were hoping for! The town itself is so charming, everyone we encountered in restaurants, shops & the chamber of commerce were friendly & helpful, & I loved that it was so centrally-located in the Cape, making it an ideal base from which to travel for excursions. In just a week, we fit a LOT in, from whale watching to a seal cruise to a Harwich Mariners baseball game to the pirate museum, to seemingly endless mini golf, go karts, & bumper boats...& still managed to get to the local beach on 5 of our 7 days. So, I was very, very happy with our stay, & look forward to establishing this as a tradition for my son & I. We hope to be back next year! We had a great week on Cape Cod with our two kids! The cottage, which is an apartment attached to a main bigger house, was very quiet, clean, comfortable, and affordable. We thought we'd miss our dishwasher, but while on vacation, we eat out more often (at the beach and at restaurants) so doing a few dishes wasn't a big deal. The location is great, being a short 5 mins walk to town-operated Pleasant Road Beach (surprinsingly warm water) and on a lovely side street. The central A/C was appreciated on humid days, as well as the wi-fi and cable TV in the evenings. The beach chairs and umbrella were great to have since we didn't have to bring our own. We also visited beaches on Cape Cod Bay (tide pools, turquoise waters) and the Atlantic (much colder water but more waves and less seaweed), which were a reasonable 20-30 mins drive away. Lots of restaurants, homemade ice cream places and quaint shops to choose from in nearby Harwichport, Dennis and Chatham. We went parasailing in Yarmouth and caught a baseball game in Chatham. We would definitely recommend this property rental and hope to be back one day to do more things like whale-watching and a day-trip Nantucket or Martha's Vineyard! We had a wonderful week at this rental which is comfortably situated in a quiet neighborhood near the beach. The kitchen and living room layout were ideal for being able to keep tabs on our toddler yet still make dinner and relax (I was 6 mo pregnant). The quiet streets were great for walks to the uncrowded beach as well (it was early in the season though). The backyard was great for grilling as well. The location on Cape Cod was also perfect for sightseeing - we could easily access most towns with a very short drive. Our only big concern was that when we booked it wasn't entirely clear that this was an apartment to the house - I'm not sure we would have booked here due to our fear that toddler temper tantrums would disturb whomever was living in the main unit at ungodly hours. The owners were wonderfully gracious and we have no idea whether we caused a stir or not! Great week though. Fun and relaxing vacation at the Cape! Our family of four loves staying here! The house is very comfortable, and the kitchen is newly updated. The street is quiet and very family-friendly, while still close to a lot of great restaurants and shops. We loved being able to walk to the beach (no need to buy a beach parking permit!) and the water is much warmer on this part of the Cape than others, so we were all able to go swimming. If you are a beach lover, you will be perfectly content to hang out on the beautiful beach, but there is plenty for others to do as well - kayaking, parasailing, shopping, antiquing, biking and more are all available just a few minutes away. We are so glad we got to spend our vacation in West Harwich! My family and I just returned from our 15th consecutive year at this "home away from home". We look forward to our trip to this meticulous Cape home and enjoy all the amenities, including a gas grill, outdoor furniture, clothes line, outdoor shower (the kids ultimate favorite) the beach chairs/toys in a well maintained and private back yard. The home itself is very cozy and spacious for a family of 5. There is plenty of closet/storage space, very comfortable beds and my husbands favorite, central air!!! All the utensils for cooking/baking or barbecuing are provided. There have been many updates to the home over the last couple of years, which make the home feel very " Cape Cod-ish". The neighborhood is beautiful, and very safe. You can walk or bike for several miles, while enjoying all the freshly manicured lawns and gardens, which overlook the ocean. The owners have been very gracious and attentive, year after year. They are generally occupying their side of the home, but because of the firewall separating the two spaces, there is complete privacy as far as noise is concerned ( thank God, with my 3 early risers!). West Harwich is definitely my favorite town on the Cape. It is so close to everything, yet the location of the cottage allows you to feel removed from the bustling streets of the Cape. There are excellent restaurants, fabulous pizza, the famous Sundae School Ice Cream, quaint gift shops as well as a multitude of activities for the kids.....Go carts, bumper boats, mini golf, trampolines, batting cages and arcades. Never a dull moment, yet never enough time!!! I can't wait for next July!!! 50% deposit due at time of booking. 50% due 5/1 for all summer rentals. You may still pay by check and avoid additional fees.